Well last week I finally got around to sorting out the laptop I use for UT. I dug out the 250GB SSD I bought a while ago - I tried to install Win7 on this to replace the Win8.1 I had on the machine, which I couldn't stand. But for some reason it wouldn't install and so it then got put away in a drawer for another day. I downloaded the Windows 10 64 bit iso from M$ for a clean install, put the SSD in the laptop and after some BIOS fiddling (Legacy Boot Mode to boot from the internal DVD drive WTF? ), managed to get it to boot from the DVD and install. It all went ok, it found all the drivers automatically and updated. Boot speed is now fantastic, about 8 sec from hitting the on button to the login screen. However, when I installed UT it still isn't possible for me to adjust brightness/contrast or gamma in the game settings and so everything is still dark. But still not completely exorcised Cortana from the machine yet. I've disabled her, but she's still lurking in the background, sulking away, using resources. How are you getting on with Win 10? Which Win 7 version you tryed with which BIOS? Could it be that there is a problem with the Bios that it will not allow to install Win 7? Like UEFI-OS insted CSM-OS (Compatibility Support Module)? The normal standad values should work for gamma and so. You tryed to adjust them inside the .ini? Or tryed to set special seetings for the programm direct inside the GPU-driver? It's also just black inside the windowmode? Tryed compatibility-mode? Is Cortana the thing that is there insted the Internet-Explorer? Because you can't delete the Explorer full with the normal options, too? I've thought about using Linux, but as you say, it has issues setting it up with games, UEFI issues with modern hardware, you don't know if you'll be able to get a driver for your hardware and you have to hope guys who are usually doing things for free in their spare time can keep up with patches to keep the operating system etc secure. The other thing is at work I am stuck using M$ office products and it's a case of trying to find something compatible (and I mean 100% compatible) with office files etc. The Win7 I tried installing on my Win8.1 machine was a 64 bit home edition which I bought from a reputable source. It would boot from the DVD and run setup, but then hang up at the "Starting Windows" page. I gave up after that as Win10 came out as a free upgrade and I don't get much time these days to spend messing with computers. With Win 10 on my Win 8.1 machine, the screen in UT is not completely black, just darker than it should be and you can't adjust it. I did try to do it manually in the ini file, but that didn't do anything either, no matter what values I put in...still too dark. I tried running UT in a window, but then the gamma/brightness/contrast options are greyed out and the sliders can't be adjusted. I tried running in Win7 compatibility mode, but that didn't help. I haven't tried any special settings in the GPU driver, I'll have to look into that, but at the moment it only has the driver installed and doesn't have AMD's Radeon control centre or whatever. Cortana replaces the search function and acts like a digital assistant, it sits on the task bar. My response to which is also digital...a single digit raised in the middle of my hand... and I don't need to install a "gesture control driver" for that! In a related - and long overdue too, if you ask me - development regarding all the insidious methods Microsoft has employed over the past year to push its Windows 10 [s]spyware[/s] operating system, a woman in California will be paid $10,000 by the software giant for the mess a forced Win10 "update" caused to her PC (and business) as a result of a settlement. Microsoft has agreed to pay a Californian woman $10,000 (£7,500) after an automatic Windows 10 update left her computer unusable. Teri Goldstein said her Windows 7 computer had automatically tried to update itself to Windows 10 without her permission. She said the update had made her machine unstable, leaving her unable to use it to run her business. Microsoft said it had dropped its appeal to save on legal costs. Microsoft has been aggressively pushing the latest version of its widely used operating system, which is currently available as a free download for computers running Windows 7 and 8. 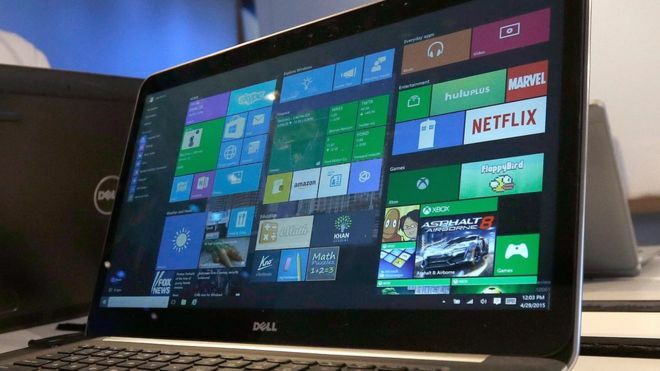 However, many people have chosen not to upgrade, because they are running old hardware, have software that does not run on Windows 10, are concerned over the software's tracking features, or simply do not want it. In February, the company bundled Windows 10 in with its security updates and made it a "recommended update", which meant it was automatically downloaded and installed unless blocked by the user. Some people accused the company of trying to "trick" customers into installing the update. The Seattle Times reported that Ms Goldstein's computer had "slowed to a crawl" after the update, and Microsoft customer support had not fixed the problem. "I had never heard of Windows 10. Nobody ever asked me if I wanted to update," she told the newspaper. Here's hoping this might also open the gates for class-action lawsuits in the US, and/or similar suits or legal oversight in even more pro-consumer jurisdictions, that will reach a conclusion rather than getting settled out of court and possibly even set a legal precedent (or show good legislative reason), effectively curbing/outlawing many of these (EULA-foisted) practices that Microsoft has so shamelessly been inflicting upon the Windows user base simply for the sake of better marketing/ad numbers. And should any of that come to pass, Redmond will have absolutely nobody to blame but themselves. Windows10 can slip on your computer as a system update. The same thing happened to me. Windows 10 is rather invasive and I was also wondering that how Microsoft could get away with, because I'm quite sure that the company broke its part of the terms. I've heard that even if you disable the system updates, W10 can still got on your PC. On the bright note: Windows10 is relatively good now in terms of stability. However the performance needs some tweaking, because lots of unnecessary applications start with W10. The user interface is a total garbage now and totally lacks logical structure. Win XP here still rolling! joeblow wrote: Win XP here still rolling! I hope you don't use that XP machine for doing anything important, like online banking? XP hasn't been supported with updates for a long time now. I'm sure there will be all sorts of things out there circulating around looking for XP machines to attack. It's quite worrying that a lot of equipment still has an XP embedded OS operating it...I think many ATM cash machines still use it. [P]etya wrote: Windows10 can slip on your computer as a system update. The same thing happened to me. Windows 10 is rather invasive and I was also wondering that how Microsoft could get away with, because I'm quite sure that the company broke its part of the terms. I've heard that even if you disable the system updates, W10 can still got on your PC. I almost fell for that on my Win7 machine...I had a pop up saying Win10 was scheduled to install at a certain time that day, but there was no cancel option! All the available obvious buttons seemed to just allow you to install immediately, or later that day. Luckily, I managed to find a small and confusingly labelled button, which stopped it. I think I will stick to Win7 on this machine. When a company like Microsoft offers free upgrade you always have to be suspîcious lol.